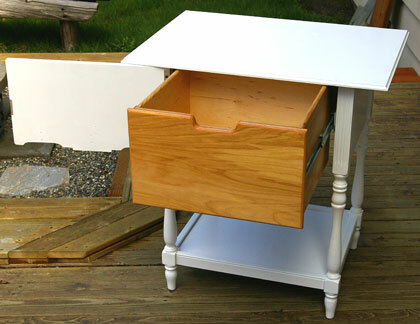 The RunnerDuck Sewing Machine Table Conversion plan, is a step by step instructions on how to convert an old sweing machine table into a nice storage table. 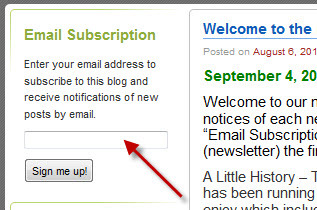 This project appeared in our April 4, 2009 Newsletter. This project just sort of evolved. 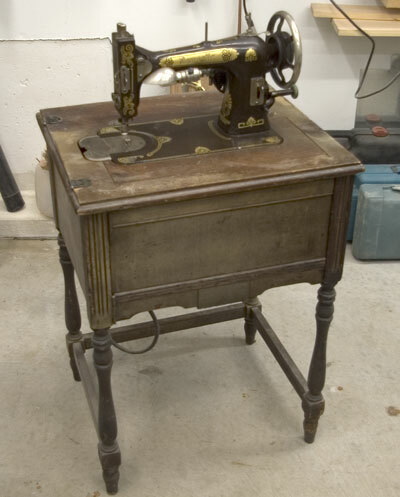 We had this old sewing machine in a cabinet that was in really bad shape. I always had visions of restoring it someday but upon closer examination it looked like more work than it was worth. I did some web searching to find out the value of the machine and cabinet and discovered that in the current condition it was worth somewhere between $0.00 and $10.00. Even in excellent condition it would only be work $100. We decided instead to make it into a table with a drawer. In a future project I am going to make an indoor greenhouse to go on top of it. There are no dimensions for this project because if you tackle something like this it will be different than this one. Hopefully the ideas we have will inspire you to take on your own project. 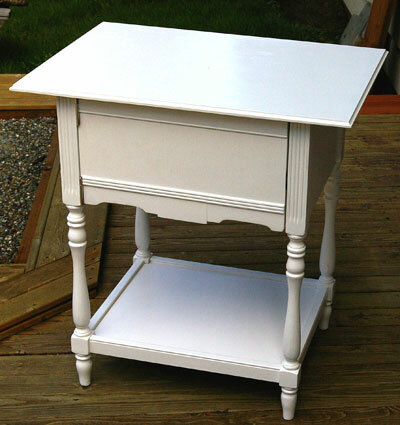 Notice that the top that usually folds out to extend the table is missing. 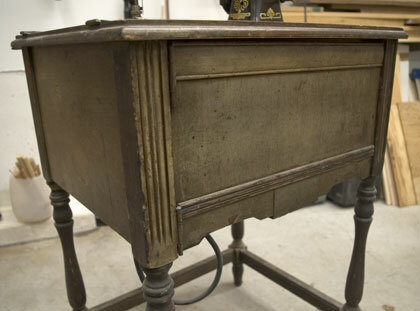 Here's a close up of the cabinet so you can see the condition. There was a lot of stuff behind the front door that needed to be removed. One of legs had apparently attacked a dog who immediately took revenge against it. 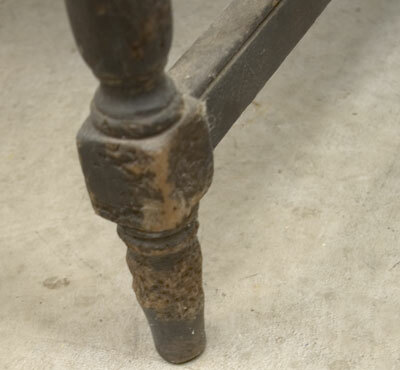 The first thing I tackled was adding a rail across the bottom front of the legs to match the other rails. I wanted to add a shelf to the bottom and this rail was needed. There has been a lot of talk lately about "memory sticks" and this project seemed like the perfect place to try it out. 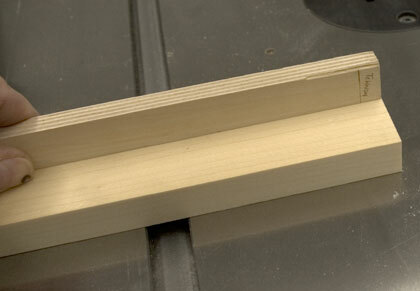 I took a scrap piece of material and marked the length of the rail and the length of the tenon on the stick. I transferred that information onto my rail. 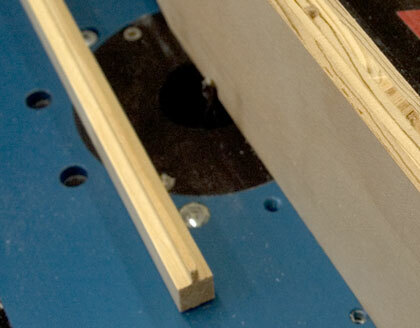 I cut the tenons on my tablesaw and then transferred that dimension directly to the leg for the mortise. 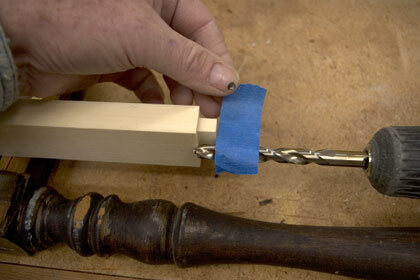 I marked the depth of the tenon on a drill bit with a piece of tape. 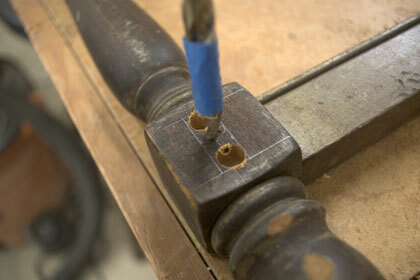 Then I drilled holes in the leg where I had marked. 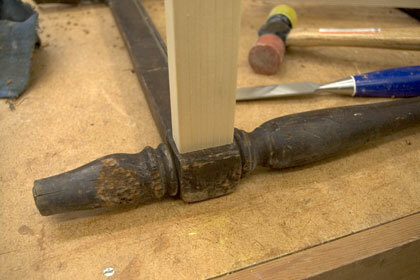 Next I chiseled the mortise square to match the tenon. 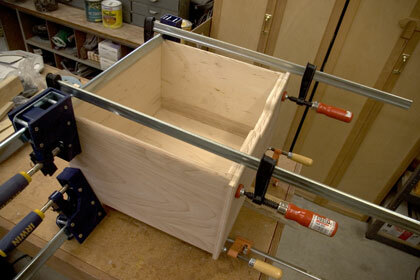 Next I gutted it and made room for a large drawer. I decided to reuse the hinges and door catch so I saved the parts in a marked bag, that way I wouldn't loose them. I used a memory stick once again to make the measurements for the drawer. I had to build out a rail support on each side of the cabinet before I could build the drawer so I'd have the final dimension. 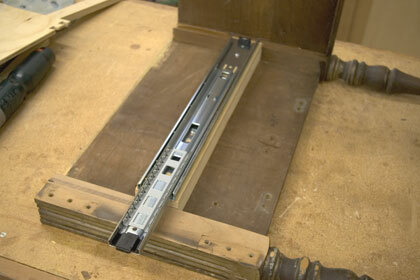 To get the final drawer width I installed the slides. 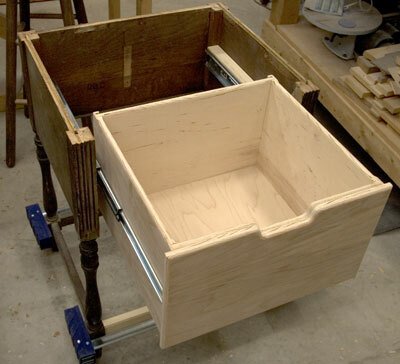 I made the drawer using dado joints in the back. For the front I stacked two pieces of wood making the inside one match the back of the drawer and just glued and nailed to the sides. 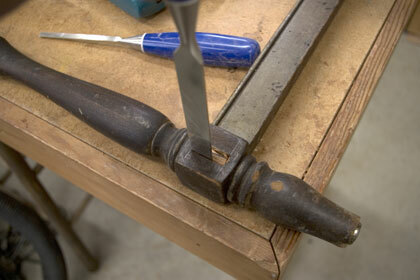 I cut a notch in the front of the drawer for a hand pull. I glued and clamped it all up and it was good to go, after a little varnish. 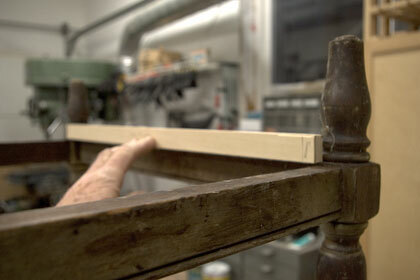 Next I cut, glued and nailed a couple of small supports at the bottom of the rails to support the new shelf. 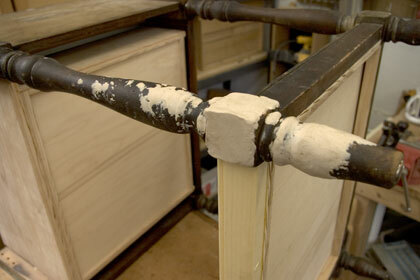 Once that had dried I cut a piece of 1/2" plywood to fit inside the base on the runners. The chewed leg looked pretty bad so I needed to patch that. I found some wood epoxy, mixed up a batch and started piling it on. 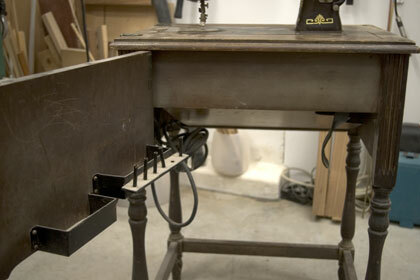 After it cured I used a wood rasp and sandpaper to get it back to it's original shape, sans chew marks. Next came the top which I made from 1/2" plywood and some pine that I had lying around. 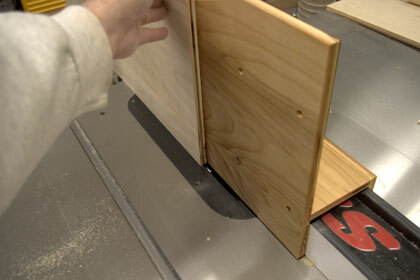 I decided to put a 1/2" decorative edge around the plywood to hide the plywood edges. I cut the top 1 1/2" larger then the cabinet. 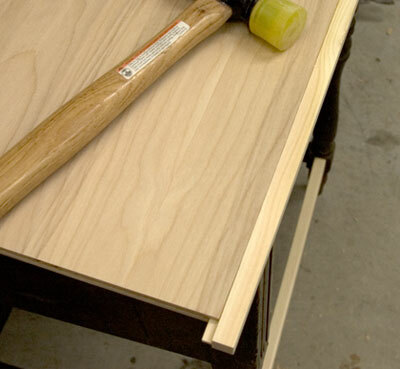 I made a tall fence for my table saw and cut slots in all four edges of the plywood. 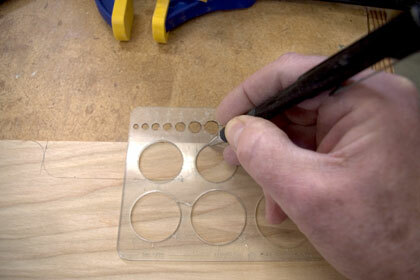 Next I used my router to cut a matching tongue in the edges. 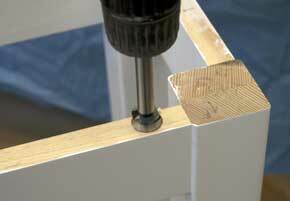 The edges were placed into the top to mark the miters. 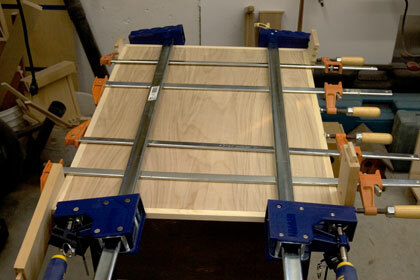 The miters were cut and the edges were glued into the top and clamped. 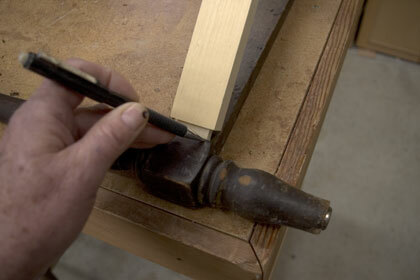 After the edges were dry I routed a decorative edge all the way around. 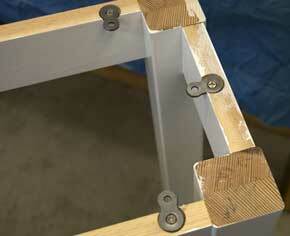 I used figure eight fasteners to hole the top to the base. 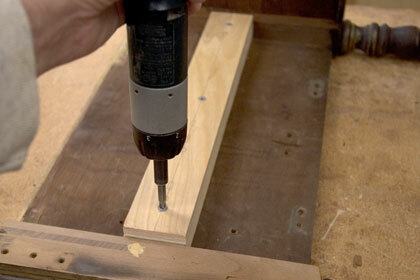 Drill countersink holes with a Forestner bit so the figure eight fastener is flush to the top. 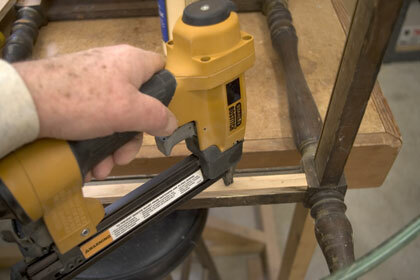 Screw in the figure eight fasteners with flat head screws. After a good sanding I applied about three coats of paint and put it all together. It's fun to make something new out of what would have otherwise gone to the dump. I hope you can find something like this to work on for yourself. That's about it. We hope you liked this project. If you build it and your friends ask where you got such a clever idea, please tell them that you got it at RunnerDuck.com.